A bundle perfect for Healthy Living! 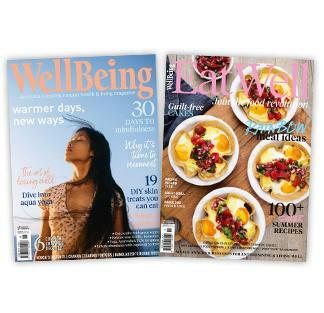 Wellbeing Magazine is Australia’s leading natural health and living journal, which offers an intelligent reading experience.It reviews the latest developments in natural living, and provides inspiration for a way of life that is authentic and soulful. EatWell Magazine includes regular tips from the chefs and bloggers that have helped us put each issue together. With over 70 recipes EVERY edition, giving you quick tasty and healthy meal solutions! These Magazines are Bi-Monthly titles and will be released alternatively each month. Picked up an old coffee in hospital when my husband was having major surgery for pancreatic cancer.flipped through the fantastic receipies with healthy and exciting ingredient, just what we want need right now to get us through this ordeal. Love Adam Guthries vegan receipies as I feel eating more plants and less meat is a high priority for our health and will help most modern ailments. So I intend to Eat Well so thanks for a great mag!